A wonderful groundcover plant for a sunny position in the garden, Phlox subulata is one of two species known as Creeping Phlox, the other is a shade loving species. Phlox subulata works well as a ground cover plant and is excellent on a gentle slope or in the rock garden. From a small pot it will spread by underground stolens to cover a good areas, it looks great if left to cascade over a low retaining wall. One of the main tricks is to prune back after flowering, this encourages good dense new foliage growth and perhaps some more flowers. Some gardeners like to dig a little lime into the soil before planting. In Australia’s conditions some extra water during the heat of summer will be beneficial. Consider planting where a little afternoon shade is available in hot areas. Dig in some well rotted compost and aged cow or sheep manure before planting, water in well with a liquid seaweed fertilizer for excellent results. Easy by division in late winter to early spring. 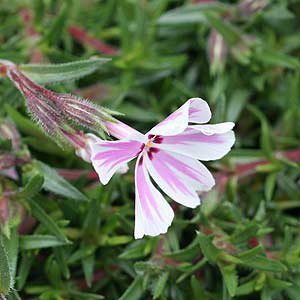 Phlox subulata can also be grown from seed best sown in early spring, or late winter in a greenhouse or cold frame.